In a surprising move, Intel has announced plans to discontinue a number of their 802.11ad products. The company intends to cease shipments of the majority of its WiGig devices by late 2017. Intel has not announced any replacements for the 802.11ad parts and says that it would focus on WiGig solutions designed for VR applications. Intel is formally initiating the EOL program for the Wireless Gigabit 11000 and Tri Band Wireless-AC 18260 controllers, the Wireless Gigabit Antenna-M M100041 antenna and the Wireless Gigabit Sink W13100 sink today (September 8). Intel is asking its partners to place their final orders on its WiGig-supporting network cards, antenna and sink by September 29, 2017. The final shipments will be made by December 29, 2017. Update 9/13: ZDNET has received word from Intel that they will continue to offer its Tri Band Wireless-AC 18265 controllers as well as the Wireless Gigabit Antenna-M 10101R products. So far, the Wi-Fi Alliance has not certified the controller as well as the antenna, so the only Wi-Fi-certified products from Intel are the Tri-Band Wireless-AC 17265 and the Wireless Gigabit Sink W13100 (code-named Maple Peak). Typically, Intel continues to sell its products for at least several quarters after it initiates its product discontinuance plan. Four months is a relatively short period between the start of the EOL program and its finish, which may indicate that the company has a relatively limited amount of customers using the WiGig products and it does not expect them to be interested in the devices in 2018 and onwards. 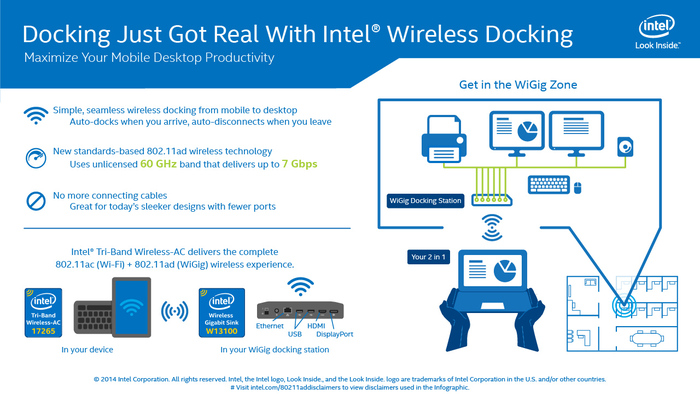 Last year Intel already announced EOL plan for its Tri Band Wireless-AC 17265 controllers and select W13100 dock SKUs. Coincidentally, the company stops their shipments on December 29, 2017, as well. 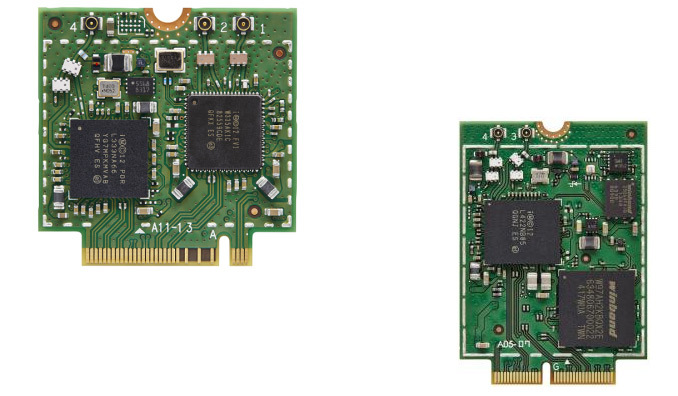 The WiGig short range communication standard enables compatible devices to communicate at up to 7–8 Gb/s data rates and with minimal latencies, using the 60 GHz spectrum at distances of up to ten meters. WiGig cannot replace Wi-Fi or Bluetooth because 60 GHz signals cannot penetrate walls, but it can enable devices like wireless docking stations, wireless AR/VR head-mounted displays, wireless storage devices, wireless displays, and others that are in direct line of sight. 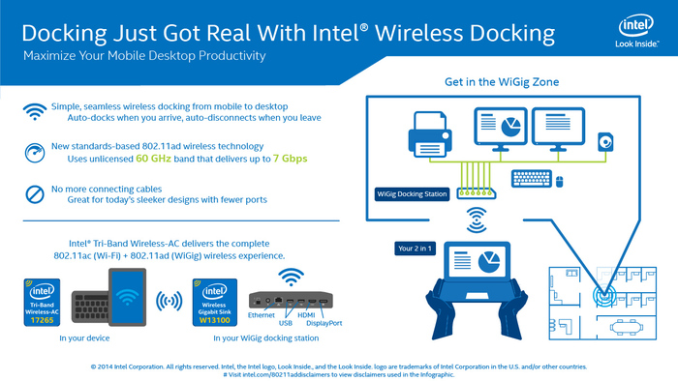 Intel’s current-generation WiGig products were designed primarily for notebook dockings. A number of PC makers released laptops featuring Intel’s Tri Band Wireless-AC 18260/17265 controllers and supporting docks featuring Intel’s Wireless Gigabit Sink W13100. These WiGig-enabled solutions were primarily targeted at their B2B customers in business and enterprise segments. However, WiGig has never seen any adoption in mass-market laptops, displays and other devices. The vast majority of advanced notebooks these days come with either USB 3.1 Gen 2 Type-C or Thunderbolt 3 ports supporting up to 10 or 40 Gb/s data transfer rates (respectively), DisplayPort 1.2 and other protocols, thus providing far better performance and functionality than WiGig, albeit at the cost of a tethered connection. Meanwhile, the WiGig ecosystem has so far failed to become truly comprehensive, which is why the technology in general has never actually competed against Thunderbolt 3 or even USB 3.1 Gen 2. Therefore, Intel is pulling the plug on the current-gen WiGig products. They have never become popular and they are not going to, which is why Intel does not see any reasons to continue selling them. Meanwhile, this does not mean that the company intends to stop supporting them: the chip giant will continue offering drivers and support for its WiGig products in accordance with requirements. What is interesting is that Intel is not disclosing whether they have plans to introduce any new WiGig products for laptops or tablets, byt they say they will be continuing their 802.11ad work with a focus on VR headsets. Earlier this year HTC and Intel already demonstrated a wireless HTC Vive operating using the WiGig technology, but didn't reveal whether it used its off-the-shelf WiGig silicon or custom yet-unannounced solutions for the project. 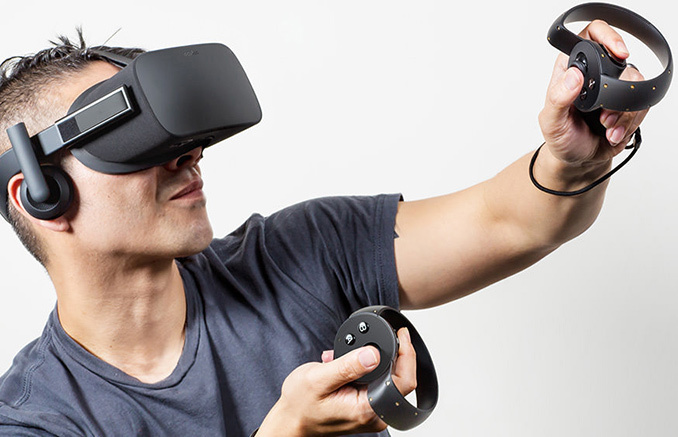 Intel and HTC are not the only firms trying to use WiGig for VR gear. A number of companies (DisplayLink, TPCast, etc.) have been trying to use the millimeter wave radio technology to build wireless VR headsets and some of them even demonstrated their devices at MWC 2017 earlier this year. AMD acquired Nitero for its millimeter wave radio tech and Facebook’s Oculus VR is working on wireless Project Santa Cruz HMD. All-in-all, while WiGig has not become popular in laptops, it may well power next generations of AR/VR headsets. Is there even anybody else making 802.11ad network cards? I've only ever seen the Intel ones for sale. In principle you can buy one and add it to an existing laptop, but the antennas seem to be unobtanium and most laptops don't have room to install 3 antennas anyway. The card itself is also a bit wider than normal which prevents it from fitting in some laptops. I was going to say, it is pretty much just Intel and Qualcomm that I have seen, and only Intel making the cards, while qualcomm puts it in their chips. You might be jumping to conclusions here, aren't they integrating wifi ? If they are, then there is no need for these discrete solutions anymore.